Profitez de l'expérience Old Orchard Beach. Nous sommes à seulement 75 mètres de la plage et à seulement 10 minutes à pied du centre-ville de Old Orchard Beach et de toutes ses attractions, dont Palace Playland, un golf miniature, de superbes boutiques et de bons restaurants. Cette unité au 2ème étage deux chambres à coucher et un bain dispose d'une cuisine entièrement équipée et un salon spacieux. Une chambre a un lit queen size et l'autre chambre a un lit superposé avec un plein sur le fond et jumeaux sur le dessus. Il y a 2 ponts spacieux, le pont avant donne sur East Grand Avenue. Il y a Direct TV, Wi-Fi et AC unités de la chambre et un charbon de bois. Sept miles de plage de sable où vous pourrez bronzer, nager et faire du body-surf. Vous êtes à 20 minutes du centre-ville de Portland et du Vieux-Port et à 30-40 minutes de la région de Kennebunkport. Profitez de feux d'artifice sur la plage tous les jeudis soirs. Nous avons également 2 autres propriétés disponibles sur le même site. On a 2 chambres / 1bath et dort jusqu'à 6 (propriété 7040039) et l'autre est un chalet 1 chambre / 1 salle de bain qui peut accueillir jusqu'à 4 (propriété 4488806). Loved the location!! Easy walk to the beach! I would give it 4 stars because of the location which was wonderful with morning and evening walks on the beach. It’s a fun town to visit and we took daily drives to see all the areas surrounding it. We especially loved the Kennebunkport area! 3 stars for the house which was clean but not well stocked with basics like extra toilet paper or salt & pepper! Tiny bathroom and kitchen but they are adequate. Steep stairs to the upper rental so be aware if you have any physical issues. All in all we enjoyed our stay! We enjoyed our stay. Beach is great and not far at all! Bathroom is very small in the upper unit. If I rented again I would definitely take the lower unit. Terribly need a rug in kitchen. Coming in from the beach in the morning was hazardous. The two decks are really nice. And nice people too!! We are glad to hear you enjoyed your stay at Nautical Point. I did pass on to our cleaners the need for a rug in the kitchen and they will take care of that in the future. We hope you come back and visit us again. We found the house for the most part to meet our needs and to be perfectly located to the Portland and southern coastal Maine areas and lighthouses we wanted to visit the few days we were in that area. However, I would have given more stars had we not have been unpleasantly surprised to find when we got ready for bed, that the beds which were made up when we arrived, did not have sheets or pillow cases. This was our first visit to Maine and as avid pleasure and business travelers, we utilize VRBO in much of our travels. I have never stayed in a house or condo through VRBO that did not have pillow cases and sheets on the beds. Our flight arrived late in the day on Sunday and after locating the house and unloading our luggage, we ventured out to find dinner. Even though it was early evening, we found most restaurants in the area to be closed. We drove around and at 7:15, finally found a great little Italian restaurant which was still open. It was next door to a local Dollar General Store which we were happy to see was also still open allowing us following our dinner, to buy a few snacks and supplies for the rest of our 10 day travel throughout Maine. Upon return to the house around 9:15, we unpacked and being exhausted after a long day of travel decided to go to bed. Imagine our surprise to find no sheets on the beds or anywhere in the house. By this time we did not want to venture back out, and were not sure if we would even find a place open with sheets for purchase, so we made do. The next morning I called the owner to inform him about the lack of sheets. I found him to be a little abrupt in informing me that it was clearly in the VRBO detail of notes that linens were not provided. This is something we have never experienced using VRBO properties. Having researched the weather for the areas we had planned for our 10 day fall coastal and Sugarloaf visit in Maine, packing to remain within flight weight limitations was already a challenge. Our options were to pay an additional price to have an emergency set of sheets from their "storage shed" delivered or go out and buy a set of sheets for the beds we used. The owner made it sound that linens were not typically supplied in other Maine VRBO properties. However, the two other VRBO properties we reserved for our travels on to Sugarloaf and Corea, Maine areas, had pillow cases and sheets on the bed. Providing linens is something we think the owner needs to strongly reconsider. This is first time that we have ever been contacted by one of our guests because there were no bed linens provided. The details on our property description on Vacation Rentals/VRBO are very explicit that we do not supply bed linens and even gives the size of the beds in each of our properties. So we were surprised when we were contact by our guests but were able to send cleans bed linens to them the day they contacted us. We have been renting our properties in Old Orchard Beach via Vacation Rentals/VRBO and have never had an issue with bed linens before. Previously we have had guests that have traveled great distances and due to flight weight limitations have contacted us directly about providing bed linens prior to their stay and we were able to accommodate them. House was in a prefect location. Across the street from the beach and close to the pier but garbenoughnawaynthatnitneas nice and quiet. The house is cute and clean and was perfect for a beachbhet away. This cottage worked out very well for us. 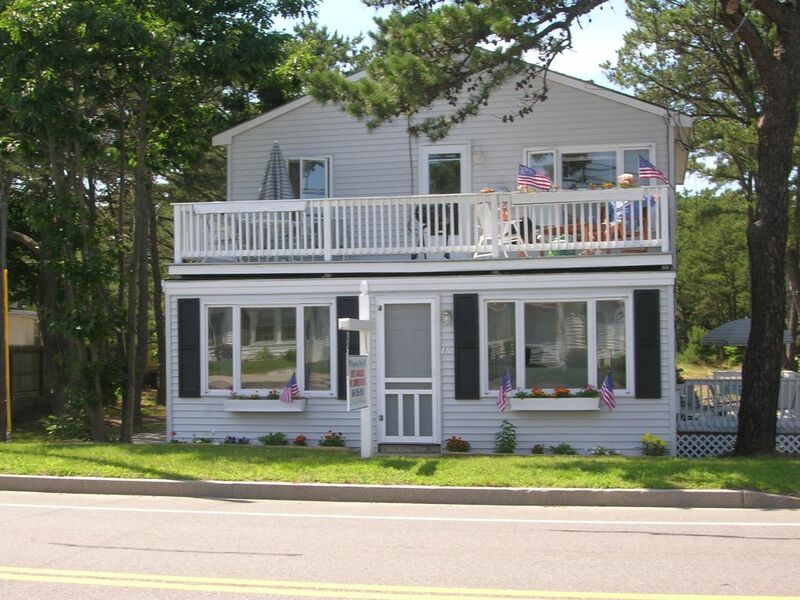 I've spent many years coming to OOB and renting cottages and this is a good one. We were quite satisfied with the rooms, beds, bathroom and kitchenette. We found everything we needed in the kitchen and cooked several breakfasts and dinners without a problem. The two decks had plenty of chairs and a table on each. I would suggest that patio umbrellas be added to each. Also, the TV is pretty small given today's standards. Be that as it may, I would definitely recommend the cottage. We slept five here on one of the nights and it was comfortable. It's a great setup for a couple of kids and parents. Finally, the location is perfect. This is the better part of the beach, IMO, and it's less then a mile's walk to the Pier and Honky-tonk and Beach variety store within walking distance. We are so happy that you enjoyed your stay with us at Nautical Point and hope you and your family come back and stay with us again. We so enjoyed our stay at Nautical Point Maine in Old Orchard Beach! We stayed in the second floor apt and had balcony's on both the front and the back of the apt. The interior was clean and had two bedrooms that were very comfortable. The kitchen had all we needed. We were in walking distance of the Pier and crossed the street to get to the beautiful beach. We found ourselves there everyday. We were 15 mins from Portland and spent a day there. We would stay here again without a doubt! We are so happy that you enjoyed your stay with us a Nautical Point. We try our best to have all the amenities that our guest need while they are staying with us. We do hope that you come back and visit us again real soon.